When customers of pizza restaurants couldn’t be bothered to head to the store itself to place their order and wait for it, the outlets offered phone-based order and delivery for eaters. When that became too much effort, online ordering through restaurant’s websites were introduced. Now, for the people that want a new novelty factor, or are just too lazy to move from their seat on the couch to find a phone or computer, one of the industry’s best-known brands have produced an app for the Xbox 360, working with Microsoft to create the world’s first games console pizza service (as opposed to a ‘pizza streaming service‘). The dashboard app, limited to America-only for the foreseeable future, is also recognised as the first games console app that offers the direct purchase of physical goods, and will enable users to place their orders through their Xbox 360 controllers, or with Kinect’s motion/voice control methods, with access to the entire Pizza Hut menu and the opportunity for users to create customised pizzas for their order. 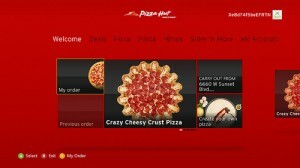 The ordering system enables the full customisation that would be seen with a regular online platform, with the additional features of synchronising Xbox Live and Pizza Hut accounts as a means of saving order preferences, along with what would hopefully be a less popular feature of being able to ‘share’ news of your order with optional Facebook connectivity. Hryb announced that while the new app is not officially the kickstart towards releasing a range of similar apps for the upcoming ‘new Xbox’, the move to release a Pizza Hut service has opened ‘tremendous entertainment options’ for them to add to the current range of gaming and streaming offerings. Having been officially rolled out yesterday, Xbox users are noted that placing an order on the app within the next week-and-a-half (through to 6 May) will see them receive a 15%-off deal if it is their first purchase through the new service. The unusual collaboration definitely has the potential to be a huge hit, but will that be down to its novelty factor, the ease of use, or its customer’s unwillingness to get up and order through different means? mmmmm Pizza…. drool.. I find it pretty easy to just pick up the phone and order my pizza!?! ?